Our winter boots take a beating. Between heat, cold, salt and road grime, caring for them is often the last thing we think to do when kicking them off in the mud room. Traipsing around in leather boots can cause damage, making our investment pieces less and less valuable with each winter storm. However, when we take time to take care for our boots they last longer, shed water better, and look their best despite the weather conditions. So, we need to take the extra time to properly care for them in order to keep them trekking a lot longer. The Professional Route: Finding a good cobbler may be difficult, so word of mouth is usually the best way to start. Check local strip malls for small shops; these are often hidden gems. A cobbler can not only condition and treat your leather boots, but they can also do major repairs such as replacing liners or shoestrings, replacing the soles or heels and more. 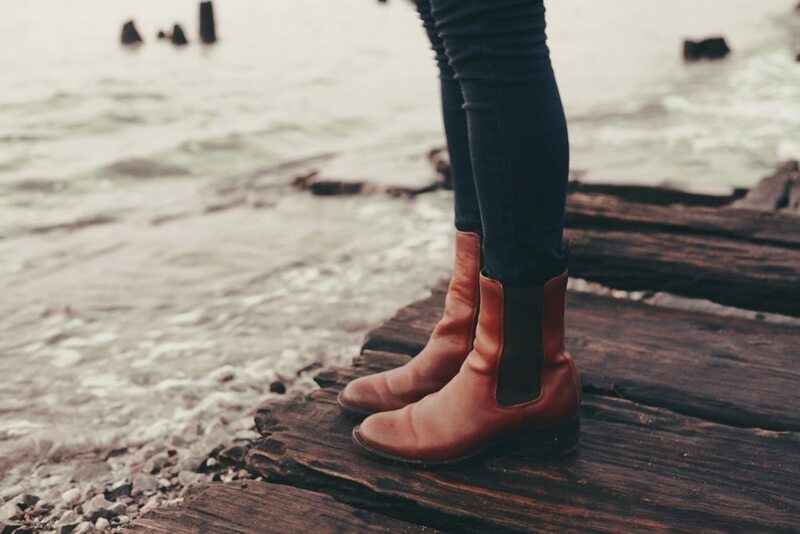 Since good-quality leather boots can cost upwards of $300, a $50 repair can be a solid investment for years to come. Be prepared to leave your boots for a week or so, as some small shops are busier than they can handle. The Middle-of-the-Road Route: The middle of the road approach means using quality leather-treatment products yourself bought from a cobbler or reputable shoe store, saving the big repairs for the professionals. For suede boots and light-colored leather, a high-quality protectant is imperative. For suede try McNett Revivex, which won’t stain, leave drips or discolor the leather. For regular leather, try the old-school Doc Martens Wonder Balsam, which works on any color. Clean the leather first with a soft, damp cloth and then apply the product of your choice. Waterproofing is of utmost importance since water can stain leather and wash away the natural oils that keep it soft and supple. The Do-It-Yourself Route: You can treat and condition your leather at home with ingredients most likely found in your kitchen and medicine cabinets. Try this on the inside or bottom area of the shoe just to be sure it reacts well before doing your entire boot. Mix ¼ cup white vinegar and ¼ cup warm water in a small bowl, and wipe the shoes with this mixture on a soft cloth, gently easing off any stains or dirt. Then wipe with a clean damp cloth, followed by a dry cloth. To finish, put 1 teaspoon of petroleum jelly on the clean cloth and rub it into the leather in circular motions. This will protect against grime and water while also restoring the luster. So whether you find a great cobbler, do some of the work at home, or go the full DIY route, taking care of your boots ensures those heirloom pieces stay beloved and beautiful. Natalie is a writer, baker, dreamer, inspirer and all-around happy girl who loves a small-town pace and a great farmer’s market. She writes about finding the beautiful in everyday life over at Good Girl Style. My boots are a mess. I need to take some time to work on them. I have heard coconut oil works as well. Any thoughts on this? I used to work in the street. Few have the time to manually clean up and protect my boots. The rest time I usually hire a professional shoeshine. This content is very interesting but it took me a long time to find it in google. Pretty sure these are Frye boots called Carson Chelsea! Thinking about getting a pair myself. What brand of boots are the ones pictured? I love them! Hi Dana! Unfortunately, this was a stock image. We tried to find a brand but came up empty. Please let us know if you can source! These are slightly similar, though in suede!